Come experience Florida’s Paradise Coast including Naples, Marco Island and Everglades. Here you’ll find a destination that Gallup-Sharecare has recognized as the happiest, healthiest place in the country over several years. The perfect place for corporate retreats, romantic get-aways, personal and family vacations! Refresh and restore on our soft sandy beaches along the Gulf of Mexico. Experience tropical wildlife sanctuaries, and lots of healthful choices of outdoor and transformational activities and services. Only 40 minutes from Southwest Florida International Airport (RSW). The Edgewater Beach Hotel is also a member of OPAL Collection an exclusive ensemble of luxury resorts and hotels. Discover an enchanting Naples retreat where casual luxury is a way of life. With a coveted beachfront setting overlooking the Gulf of Mexico and 125 modern suites, the Edgewater Beach Hotel is a charming Naples vacation resort that has defined barefoot elegance for over 30 years. The relaxed ambiance of Florida’s southwest coast can be felt around every corner of our retreat, from our thoughtfully-appointed suites to the signature cocktails served at the poolside bar. The Edgewater’s understated elegance also extends to our indoor and outdoor event space, which offers a distinctive backdrop for intimate meetings and romantic beach weddings. Situated on the shores of the Gulf of Mexico, along three miles of pristine private beach, JW Marriott Marco Island Beach Resort offers the perfect balance of luxury and tranquility. Drawing inspiration from the Balinese culture and its emphasis on the beauty of nature, a recent multimillion-dollar transformation has made our resort even more extraordinary. Relax in luxurious rooms and suites with scenic private balconies or experience Paradise by Sirene, a curated escape exclusively for adults. Explore the resort’s 12 dining options including beachside seafood, modern Italian cuisine and more. Tee off from one of two championship golf courses, or rejuvenate your body and spirit at our serene resort Spa by JW. Our expansive and flexible event venues are highlighted by picturesque terraces with awe-inspiring Gulf views. Reap the benefits of Florida’s sunny weather by sipping a drink by one of the hotel pools, kayaking or embarking on an exciting wave runner excursion. Discover Paradise Redefined. 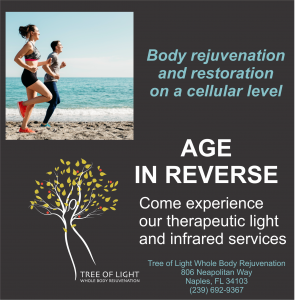 Tree of Light–Whole Body Rejuvenation Age in reverse with therapeutic light and infrared services.